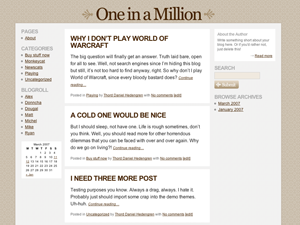 One in a Million is a three-column theme for WordPress featuring a fixed-width layout with a center-positioned main content column. The theme is easy on the eyes, using subdued hues and clean typefaces. The header and footer have an old world, homey feel to them, using a wallpaper-like pattern as background image. Yet, One in a Million is very suitable for professional and corporate blogs because of the clean and legible look. One in a Million is yet another collaboration between Performancing and Thord Daniel Hedengren, who has done countless other WordPress Themes for Performancing and Splashpress Media. Click here to preview the theme. Click here to download the theme. Update: One In a Million has been updated for compatibility with WordPress 2.7 and up. Download the latest version here. ⟵As a blogger, how do you make most of your money?